My cousin, Catherine, stopped by for a visit recently and made us something absolutely sinful: as her brother calls them, “frenchified eggs.” The thing about Catherine, other than that she never learned to draw inside the lines, is that she lives out loud. If she had a leopard-print scarf and big sunglasses, she’d get a Cary Grant boyfriend with a convertible just so she could drive around a la Audrey Hepburn. Anyhoo, part of living out loud for the cousin is an absolute intolerance for low-fat cooking. Let’s just say her eggs were tasty. I, on the other hand, have a doctor- and spousal-mandated LOVE for low-fat cooking. So, when we found ourselves wandering through our crack dealer, and noticed they had fresh truffles on sale, we immediately bought some and went about trying to decide how we should cook them. After a few quasi-failed attempts (I curdled a truffle and clam cream sauce), I settled on stealing my cousin’s eggs…with some modification. Melt the butter in a pan over LOW heat. If you’re using a gas stove, use the smallest burner possible. Add the half & half and salt to the eggs and mix. Now get ready for your morning calisthenics: pour the eggs in the skillet and start stirring. Just keep stirring. For about 20-30 minutes. Your eggs will slowly begin to curdle, but it will take a while. Be patient. You’ll know they’re ready when you stir them and rather than just moving eggs around in a swirl, you actually almost fold them. Cook for one minute more, then remove and keep stirring for another minute. Spoon on top of your toasted bread, sprinkle the truffles and parsley on top and enjoy! 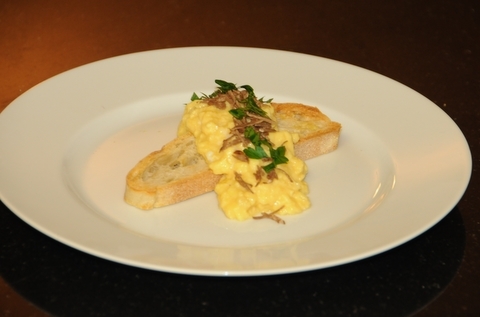 3 Responses to "Truffled, Slow-Scrambled Eggs"